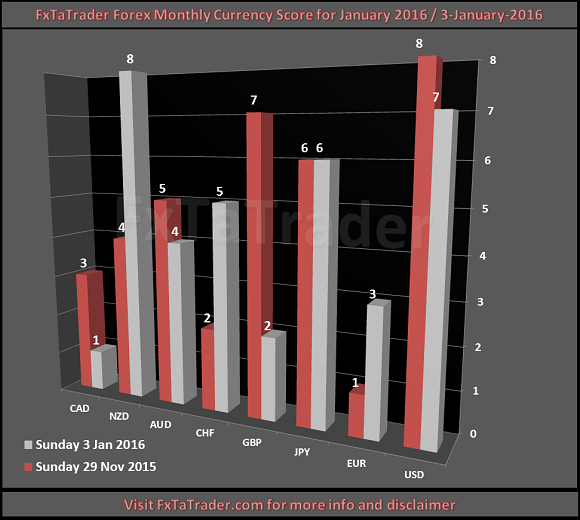 The Currency Score analysis is one of the parameters used for the Ranking and Rating list which was also published this week. Besides this analysis and the corresponding chart I also provide the Forex ranking and rating list. This article will provide my analysis on the 8 major currencies based on the technical analysis charts using the MACD and Ichimoku indicator on 3 time frames: the monthly, weekly and daily. The result of the technical analysis is the 2 screenshots in this article showing the Currency Score and the Currency deviation table. For analyzing the best pairs to trade the last 12 months currency classification is the first issue. When looking at the most recent score that is used for the coming period we can see in the screenshot below the deviations and we can draw the first set of conclusions. These are given below the screenshot. 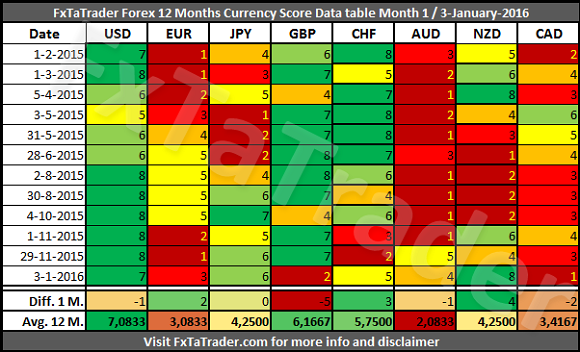 The 12 month currency score data and the 12 month average is provided here below. This data and the "12 month currency classification" are considered for choosing the preferred range. At the moment we can see that the EUR has the second lowest value in the 12 months average after the AUD. It has been lower than the AUD for 7 out of the last 12 months. For that reason the EUR now is a weak currency and the NZD an average currency. The pair combinations mentioned seem to be the best pairs according to the Currency Score. However, there are some currencies outside their default range. For that reason these currencies are analyzed in more detail in this article. A strong currency can be traded long against all the other currencies except on a pullback(deviation) then it seems best to trade it only against a weak currency. A weak currency can be traded short against all the other currencies except on a pullback(deviation) then it seems best to trade it only against a strong currency. When an average currency is outside the range(deviation) it is best not to trade it against similar currencies in the average range and the currencies in the range it is at. The Forex Currency deviation table shows the deviations and the ranges where the deviating currencies should be in. Any strong or weak currency outside the range are most probably in a pullback and loosing momentum. These currencies can best be traded according to the combinations in the group "S/W" in the Forex Group pair combinations table. All the other strong currencies can be traded according to the combinations in the group "S/A" and "S/W" in the Forex Group pair combinations table. All the other weak currencies can be traded according to the combinations in the group "A/W" and "S/W" in the Forex Group pair combinations table. Any average currency outside the range are getting stronger if they are in the "Strong" range or weaker if they are in the "Weak" range. These currencies can best be traded with the opposite range. An average currency in the "Strong" range can best be traded against a weak currency, see the the combinations in the group "A/W". An average currency in the "Weak" range can best be traded against a strong currency, see the the combinations in the group "S/A". All the other average currencies can be traded according to the combinations in the group "S/A" and "A/W" in the Forex Group pair combinations table. A good foundation is provided for looking at the Monthly and Weekly Technical analysis chart of a specific pair by using the (1)"Ranking and Rating list", published earlier this week, with the above (2)"Monthly Currency Score" analysis and together with the (3)"Currency score difference" table with the (4)"Top Forex pairs table" where the Bollinger Bands analyses are made on the interesting pairs. the "Ranking and Rating list" takes strength, direction and volatility into account. the "Currency score" looks for the strong trends and pullbacks with a possible disadvantage of being overbought/oversold. the "Currency score difference" adds granularity to the "Currency score" by using the score difference for determining potential trends. the "Bollinger Band" confirms that a potential trend found is not being overbought/oversold. With the "Currency score difference" and the "Bollinger Band" the disadvantage mentioned for the Currency score will be avoided. It is recommended to read the page Currency score explained and Models in practice for a better understanding of the article. When trading according to the FxTaTrader Strategy some rules are in place. For more information see the page on my blog FxTaTrader Strategy. Depending on the opportunities that may come up the decision to trade a currency may become more obvious at that moment. If you would like to use this article then mention the source by providing the URL FxTaTrader.com or the direct link to this article. Good luck in the coming month.